It is no secret I'm a big fan of the Aburi Restaurants Canada with their high-end Japanese in both Miku and Minanmi. Despite the premium pricing, the combination of style, unique dishes and careful execution justify it (in my opinion). 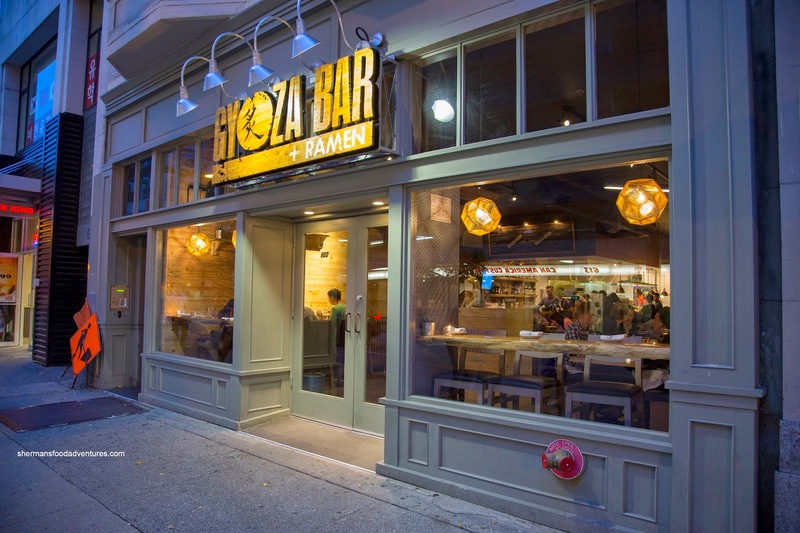 Recently opened, Gyoza Bar + Ramen is their new venture out on Pender in Downtown. It was only natural that I gathered the troops for this food adventure including Gyoza King (who is our resident expert on the dumpling). 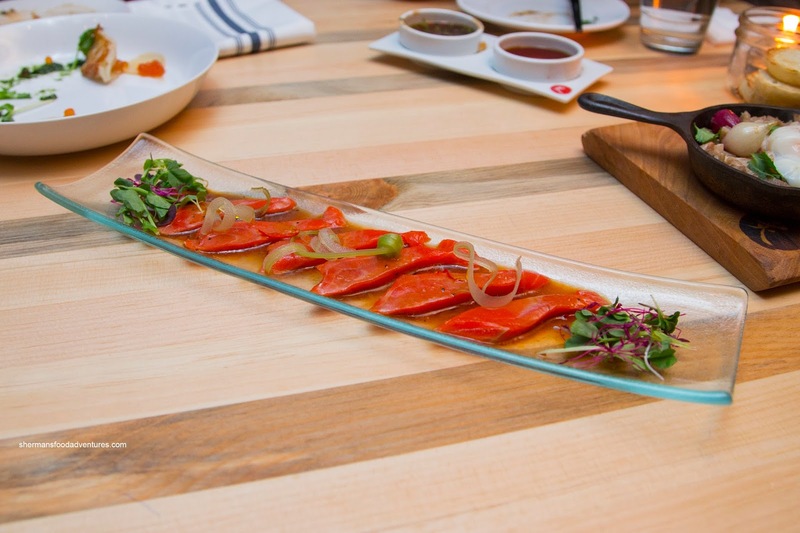 The first item to arrive was the BC Wild Salmon Ceviche with Thai Chilis, jalapeno soy and celery. There was no denying the quality of the salmon as it exhibited a buttery firm texture while sporting a noticeable natural sweetness. However, the promise of spice was really more of a sputter as it really wasn't impactful. We understood that it shouldn't overwhelm the delicate salmon, but this wasn't even close. Next was the Aburi Pork Char Sui with sous-vide egg and crostinis. 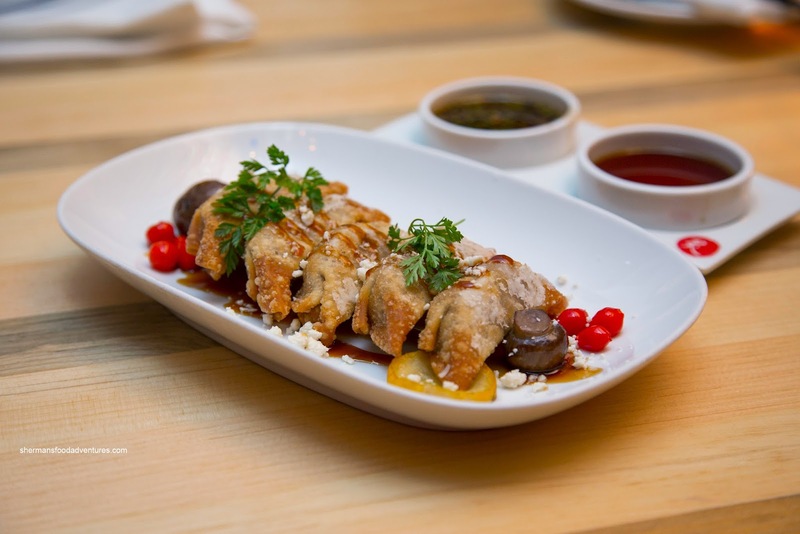 If the last dish wasn't lively, then this one just flat-lined. 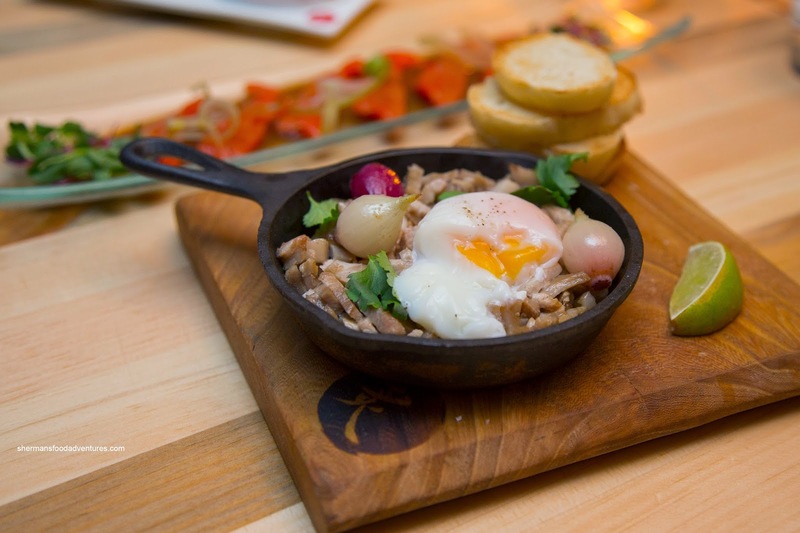 With diced up semi-firm and dry pork topped with a silky egg, this dish was left wanting for any hit of flavour. Even with the squeeze of lime, there wasn't much to bring this to life. Onto their signature dish being the Teppan Gyoza, we got both the small and large size. Both should've been super crispy and mind-blowing due to the pictures and description on the menu. However, someone should've told the kitchen... These arrived looking very much like any other gyoza. Yes, there was little nuggets of crispiness here and there, but it didn't deliver on the promise and it certainly didn't look like the picture. As for the good news, the dumpling skin was thin, tender and appealing (although it was overdone though). As for the filling, it was meaty with a good mix of cabbage. I particularly liked dipping them into the Spicy Garlic Soy as it added a good kick. 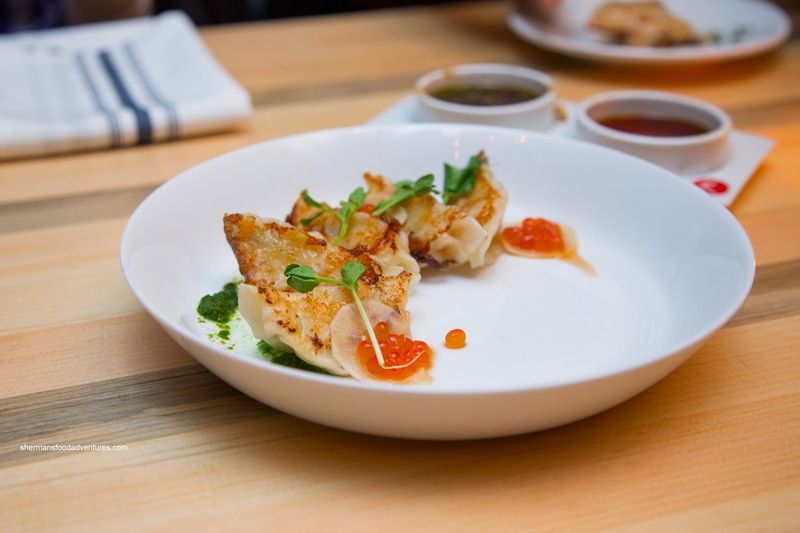 We also sampled their specialty gyoza including the Miso Short Rib with feta, pickled peppers, zucchini and jalapeno soy glaze. Again sporting that thin delicate wrapper, this was actually better in texture than the teppan gyoza. Inside, it was filled with moist short rib that was only mildly seasoned. As much as I liked this, the filling was a bit one-note in texture. Second, we tried the Chili Shrimp and Pickled Daikon with soy marinated ikura and wasabi chimichurri. It resembled a Chinese dumpling where the bits of shrimp were cold-water crunchy and sweet. But overall, there wasn't a whole lot of flavour. I guess that was forgivable since shrimp is delicate, yet there wasn't even the spice as promised. Whipping Girl and I decided to go for their Tomato-Saffron Seafood Ramen with mussels, clams, scallop, prawn, chicken and char siu. The initial sip of the soup yielded a strong aromatic saffron taste that hit our tastebuds like a Mack truck. Then it gave way to the tang of the tomato, but unfortunately ended extremely salty. We did like the seafood as it was properly prepared and not overcooked. 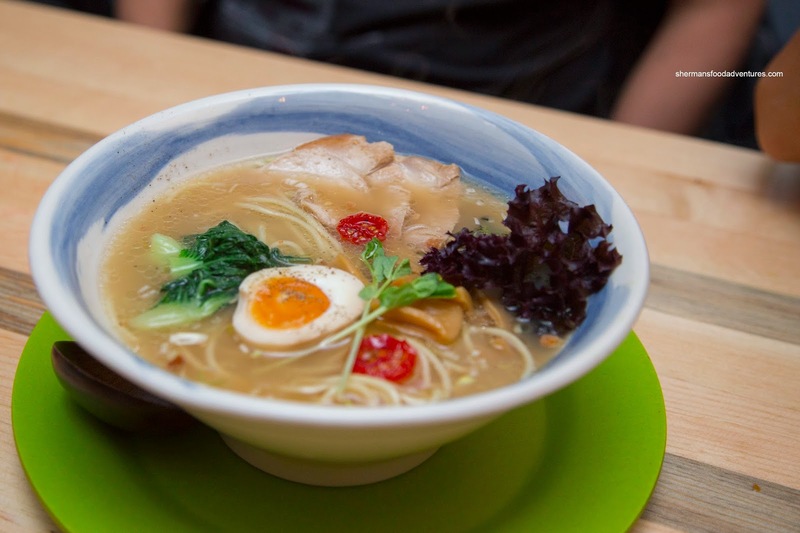 We weren't big fans of the yellow noodle as it was overly firm and lacked cohesion with the broth - it kinda just sat in the broth disconnected from the dish. 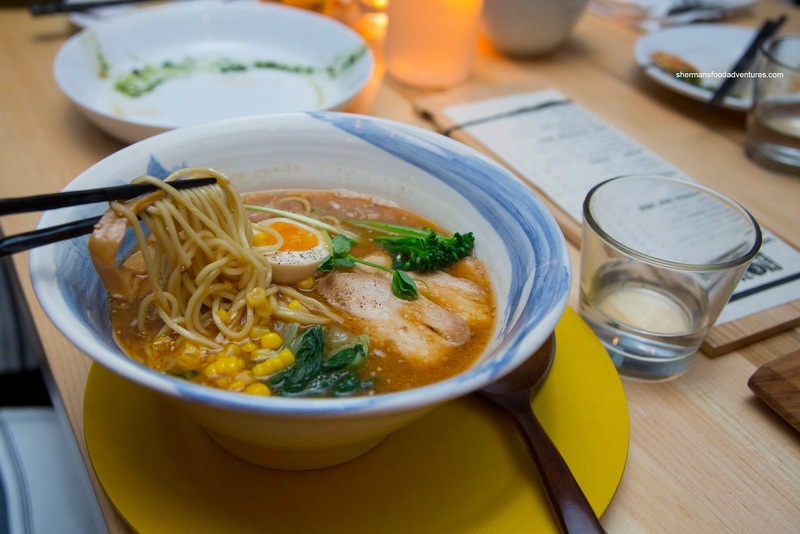 Milhouse went for the Free Range Chicken Broth with Awase Triple Miso, chicken char siu and tamago. There was no mistaking the chicken essence in the broth. Furthermore, the miso added a savoury sharpness to the broth that wasn't overly salty, but it ultimately did end off that way. 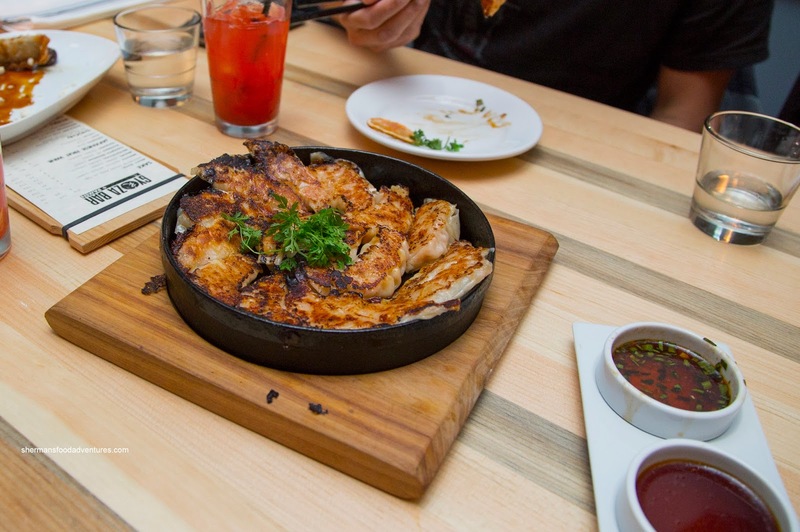 Remarkably, the slices of chicken were succulent and tender. 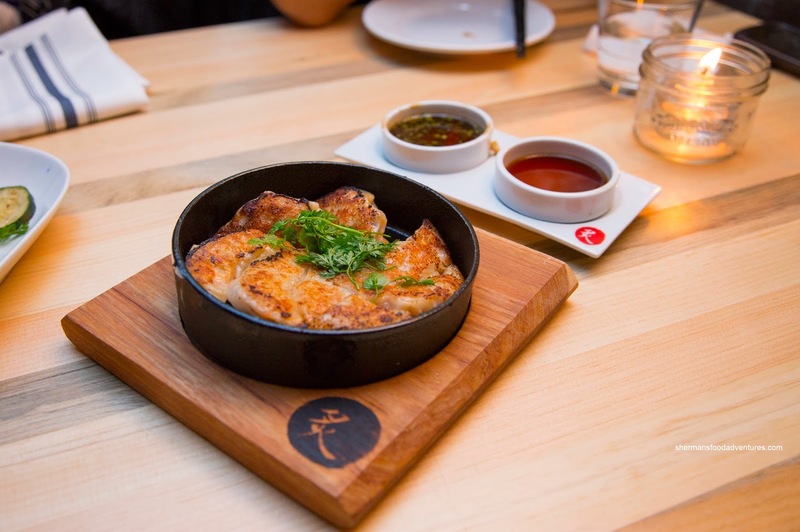 Gyoza King was not only here for the gyozas, but also for the Free Range Chicken Broth with Mediterranean Salt. 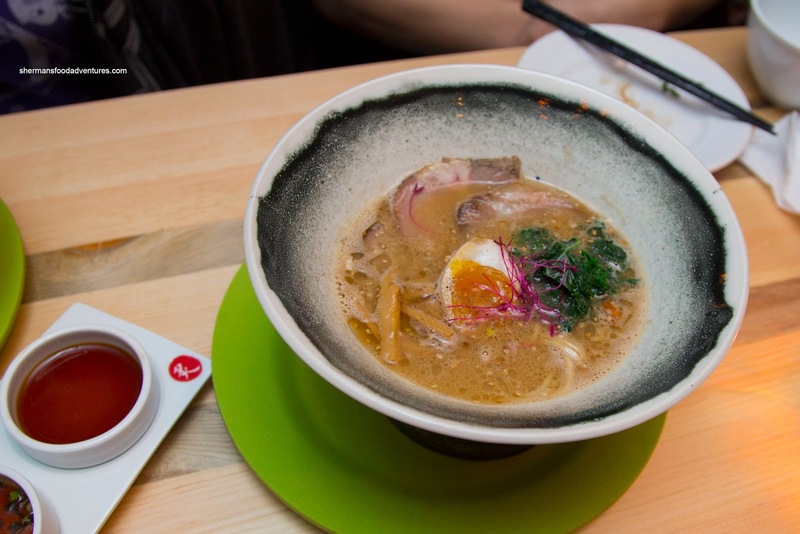 It helped highlight the rich chicken flavour more without the distraction of the miso. However, it also meant it was pretty salty from start to finish. As for the chicken, it was exactly like the other version. Bear had the Pork Tonkotsu Broth which was the least salty of the bunch. That didn't mean there wasn't any flavour though as it was porky, although not silky. The char siu wasn't exactly chewy, but it wasn't melt-in-his mouth tender either. He thought it was a decent attempt. Now that brings up a dilemma though. 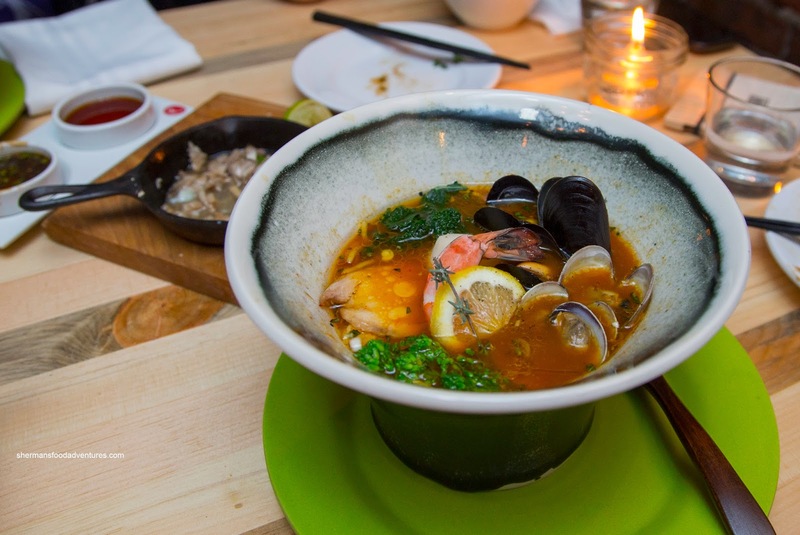 For the prices they charge ($17.00 for the Saffron Broth), is decent or "good" enough? For quite a few of us, the answer was no.